Weighing in at up to 80,000 pounds, fully loaded tractor-trailers can cause serious damage in an accident. In your standard car, you are at a great disadvantage and may suffer serious injuries and property damage if you’re struck by a truck. The aftermath of any accident—even a fender bender—is confusing and stressful. From medical appointments to dealing with your insurance company, it is easy to feel lost and overwhelmed. After a truck accident, however, it can be so much worse. Injuries are often much more severe, and rather than dealing with one insurance company and defendant, you could be facing several entities all at once—each of whom have their own legal teams. As with any accident, as soon as you attend to your medical needs, you should speak with an attorney who is well-versed in truck accident cases. 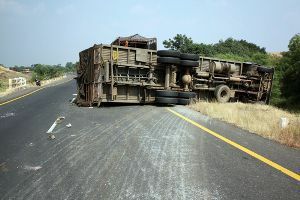 Getting proper counsel after a truck accident is even more important, because there are several parties involved that will be working diligently to pay you as little as possible. Insurance companies are known to “lowball” victims in an attempt to pay as little as possible. Many victims will jump at a settlement to simply end the process and move forward. You deserve better than the minimum offer, however, and attorney Chris Hudson can help ensure that you are given the compensation that you deserve. If you have been hurt in a truck accident, do not risk your rights and finances in an effort to settle quickly. See legal help, and seek it immediately following your wreck. Call us today to schedule your free consultation.